I also have a new post up at SFNovelists.com — “A Writer’s Belated Tribute to FIREFLY.” The post is about the ways in which Joss Whedon, and other creative stars, can teach writers about the craft of storytelling. The post is here. Today, I am truly delighted to welcome the wonderful and talented Alethea Kontis to my blog. Alethea is the author of the AlphaOops children’s books (AlphaOops: The Day Z Went First and AlphaOops: H is for Halloween) and is now about to release her first young adult novel, Enchanted. 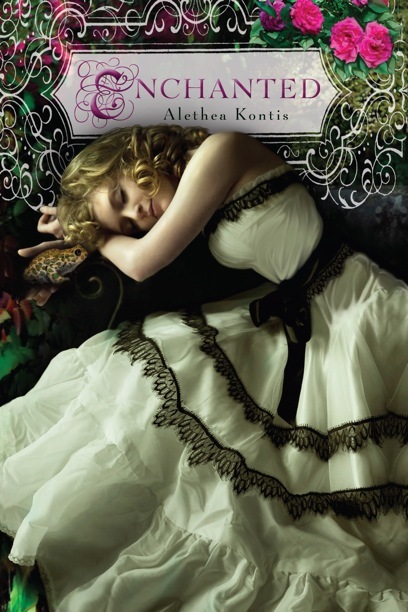 Enchanted is a wonderful book that ties together several of your favorite fairy tales into something unique and utterly compelling. I read it in about two days, and it only took that long because I needed to pause for meals and sleep. Recently, Alethea and I were able to sit down for an e-conversation about her work. DBC: Why don’t we begin by having you tell us a bit about Enchanted. What’s it about, and who do you imagine to be your core audience? AK: Enchanted is a book I would have fallen in love with when I was a young girl reading my way through the juvenile section of the library. (This is when there was only a “juvenile” and “adult” section, before the internet, back when we all rode dinosaurs.) Enchanted would have been in my checkout pile along with Diana Wynne Jones, Robin McKinley, Tamora Pierce, Lloyd Alexander, Ellen Raskin, Edward Eager, and Orson Scott Card. The premise of the world of Enchanted: All the fairy tales you’ve ever read (and many that you haven’t) all originated in the Woodcutter family. Enchanted is the story of the youngest daughter, Sunday Woodcutter. The main threads are “The Frog Prince,” “Cinderella,” and “Jack and the Beanstalk.” Ultimately, the more you know about the unexpurgated tales of Mother Goose, the Grimms, Lang, Perrault, and Andersen, the more fun you will have with Enchanted. DBC: The book is a marvelous mash-up of fairy tales — where did the idea come from and how did you manage to tie so many stories together in such an effective and innovative way? AK: The idea for Enchanted began as a contest challenge in my writers group (Codex Writers). Our stories had to be inspired by at least one of four “seeds”: “Fundevogel,” “The Princess and the Pea,” the Irish legend of Cú Chulainn, and the nursery rhyme “There Was an Old Woman Who Lived in a Shoe.” I couldn’t choose between them, so I chose them all…as well as all every other fairy tale and nursery rhyme that was suggested. DBC: It seems as though fairy tales are “hot” right now. Grimm and Once Upon a Time are on television; Mirror, Mirror and Snow White and the Huntsman are in theaters (or soon will be); and a number of books have come out in the past couple of years that also draw on fairy tales for inspiration. What do you think explains this trend? Is it just a market tide, or do you see something deeper at work? Put another way, I suppose I’m asking “Why now?” What is our culture or society getting out of this return to fairy tales? I believe this is a trend that started once upon a time in sixteenth-century Italy. We’re definitely on the crest of a fairy tale tidal wave right now. I hope that wave continues for a very, very long time…or until we all live happily ever after. Whichever comes first. DBC: I’ve noticed — and really it’s no great surprise — that so many of these fairy tale treatments have had to reexamine gender roles, and especially revise and update the portrayals of what it means to be a young woman. Your story takes a nursery rhyme about Sunday and her sisters and twists the meanings and implications in ways that the people who first came up with the nursery rhyme could never have imagined. I’m guessing that you enjoyed that. Can you tell us about that aspect of working on the book? AK: I did enjoy that, thank you! I still giggle to myself from time to time, randomly. My family tree branches are Greek and French: two old world cultures that carry with them a few old world ideas that never really go away. One of these ideas is the power of words–especially for the Greeks. Every word you say is a double-edged sword. It’s why you see them spitting all the time. If you say a baby is beautiful, you have just cursed it to grow up ugly, so you “spit” on the baby to counteract your good wishes and maintain the balance of the universe. I was also born on a Sunday. When I was young I thought the Mother Goose poem would have some brilliant insight into what my life would be…but that whole “bonny and blithe and good and gay” bunk is a crock. Who has a life like that? Who would want to? But is this the Happily Ever After all those tales elude to? There is always more to what’s written on the page, just as there is always more to people than what we see on the surface. DBC: Looking just at the Woodcutter family, the focus of Enchanted, it seems as though you have a huge amount of material still at your disposal, should you choose to write sequels. Is there an Enchanted II in the works? [If so] Can you give us a bit of a teaser? What’s going to happen next? I’m also working on many other things: short stories, essays, and picture books, as always — I can’t stay away from them. I’m super excited about The Wonderland Alphabet, that will be out next month. It’s a collaboration with my exceptionally talented longtime friend Janet K. Lee, who won an Eisner Award with Jim McCann last year for their graphic novel Return of the Dapper Men. The Wonderland Alphabet is an ABC book with Janet’s art and my poetic verses, all based on Lewis Carroll’s fabulous classic. And it’s a board book. Squee! DBC: Are you an eclectic reader or do you tend to stick with a genre? What are you reading right now, and what’s on your To-Read pile? AK: I am an eclectic reader just like I’m an eclectic writer, but I have far less time to read now than I used to and it makes me sad. I mostly read SF and Fantasy for my review column for Orson Scott Card’s Intergalactic Medicine Show–but I’ll drop everything the moment a new Jude Deveraux book is released. Right now on my TBR pile are Wuftoom by Mary G. Thompson, The Taker and The Reckoning by Alma Katsu, and Thieftaker by D. B. Jackson. DBC: What advice would you offer to aspiring writers looking to break into the young adult market? Do you think that the YA field will continue to be a driving force in publishing the way it has for the past decade or so? AK: I do think the teen section in the bookstores is here to stay, and YA is a force to be reckoned with if you’re up for the challenge. Kids are reluctant (and often not encouraged) to graduate themselves into the adult section, but adults have far fewer qualms about walking into the teen section and picking up an armload. So if a book is YA-OK, why not just list it at YA from the start? It’s a bit of marketing genius. As for new authors, I would say: be true to your voice. If you write young, write young. If your writing is more mature, go with it. YA runs the spectrum, and is very all-encompassing. If you are trying to force your voice to fit a market, you’re already starting off on the wrong foot. Write that book in your heart from the voice in your head, and let the marketing department worry about where to shelve it. WRITING will always be an author’s most important goal. DBC: Last question: If you could spend a single day as any character you’ve ever read, who would you choose and why? DBC: Thanks so much for joining us today. It’s been great having you here. I’ve Been Mind-Melded . . . Again! Once again, I’ve taken part in one of John DeNardo’s Mind Melds over at SFSignal. The question was, What fantasy novels, aside from GAME OF THRONES would we like to see adapted for a television series. My answer . . . well, you’ll just have to visit the site to find out my answer. Check it out. Today’s post can be found at http://magicalwords.net, the group blog on the business and craft of writing fantasy that I maintain with fellow authors Faith Hunter, Misty Massey, A.J. Hartley, and Stuart Jaffe, among others. The post is called “Favorites: Some Labor Day Dun” and it’s about some of my favorite books, titles, villains, heroes, and more. I hope you enjoy it. I’m not really in the mood to go off on a political rant, but I will say that these First 100 Day grade reports on the Obama Presidency strike me as utterly ridiculous. FDR did all Presidents a disservice by introducing the notion of the “First 100 Days” into the political lexicon. Yes, Roosevelt accomplished a tremendous amount in the first three months of his Presidency. He also had won an overwhelming election majority and carried with him huge majorities in both the House and Senate. He didn’t have to deal with the world of 24 hour news channels, and early on he didn’t have to deal with idiots like Rush Limbaugh and Sean Hannity (though he did eventually have to cope with Huey Long and Father Coughlin). And though he did face opposition to some of his programs, the sense of crisis in the nation at that time was so great that he had as much of a legislative free hand as any President in modern history. No President since has accomplished nearly as much in his first 100 days, and no matter how much Obama has gotten done (and I’d argue that he’s done quite a bit) it will pale in comparison. That said, the benchmark itself is worthless. The problems he has faced since taking office were years in the making. Expecting him to have solved them in three months isn’t realistic. Yet I heard someone on CNN today lamenting that stimulus spending had yet to pull the nation out of its economic troubles. It was all I could do to keep from throwing my glass through the screen. You disagree with his policies? Fine. I can understand that. You don’t expect them to work? That’s fine, too. Time will tell. But declaring his Presidency a failure after 100 days is ludicrous, and judging his Presidency in historical terms when he’s less than a tenth of the way through his first term is a waste of time. Why is it that white politicians only get in trouble when they tell a lie, and even then it’s only 50-50 that they’ll be caught, but African-American politicians get in trouble when they tell the truth? Anyone who doesn’t think that Barack Obama was speaking the truth when he referred to the bitterness in rural small-town America, is either hopelessly naive or cynically seeking political advantage (Senators Clinton and McCain take note). The economic dislocations of the past few decades have engendered resentments that manifest themselves in a variety ways including not only closer ties to religious communities, but also racism, homophobia, and hostility toward hispanic immigrants. I am SO sick of this process. Another Saturday, another BOW Award. For those of you tuning in for the first time, I give a BOW (Buffoon Of the Week) Award each Saturday to the politician or pundit who does or says the most outrageously stupid thing. This is only my third week doing this — past winners were Representative Steven King (R-Iowa) and former Representative and Democratic Vice Presidential nominee, Geraldine Ferraro. For the record, neither Rep. King nor former Rep. Ferraro has contacted me to collect his or her award. Probably a good thing, since I have no idea what I’d give them. I suppose you could say that Buffoon Of the Week is more or less an honorary title…. Okay, at the risk of revealing myself as a total West Wing nerd, I’d like to ask if anyone else has noticed the amazing similarities between this year’s Presidential race and the Matt Santos-Arnold Vinick race that dominated the show’s final season. I was in Australia for the final season of The West Wing and didn’t get to watch the episodes as the season unfolded. Instead, the Christmas after our return to the States, Nancy gave me the complete 7 season DVD collection, which I watched from beginning to end over the course of 13 months. That’s right: I only finished watching season seven a few weeks ago. And I was blown away by how closely the narrative of the 2008 race has followed that of the fictional election. On the Republican side, you had Arnold Vinick, played by Alan Alda. Vinick was from California rather than Arizona, but in other ways he was the television doppelganger of John McCain. He was a moderate Republican who had bucked party orthodoxy on a number of issues, earning the admiration of centrists and independents, but alienating the party’s right-wing base. Now the fictional Vinick was actually to the left of McCain on social issues — he was pro-choice, supportive of gay rights, and in favor of gun control — but he was also a fiscal hawk and someone who had extensive foreign policy experience. As the campaign went on, he was forced to take stances on issues that were more conservative than he would have liked, but his appeal to the political center made him a formidable candidate. The Democratic nominee, Matthew Santos, played by Jimmy Smits, was a Texas Congressman with relatively little political experience. But in this fictional America he was perceived as being honest, he inspired voters with brilliant, passionate rhetoric, and he came to be seen as an agent of change. He was also a minority candidate, a Latino who was seeking to become the first Hispanic President in the nation’s history. He ran an insurgency campaign against the better known establishment candidate and managed to win the nomination after a bitter primary battle that went all the way to the Democratic convention. Any of this sound familiar? I’m not going to give away the ending, though if you know anything about The West Wing and it’s creators you can probably guess. But one of the things I always loved about the show was it’s uncanny ability to be utterly original while so closely mimicking real-life political circumstances. Still, I never would have believed that the show’s creative team could so accurately predict what has happened so far this year.